Enrique (Henry) Barbosa González was born on May 3, 1916, in San Antonio, Texas, to Leonides González Cigarroa and Genevieve Barbosa Prince de González. His father’s ancestors immigrated to Mexico from the Basque region of Spain and settled in the state of Durango, in northern Mexico, where many of them worked as silver miners; his mother was of mixed Scottish and Hispanic ancestry.2 In 1911 Gonzaléz’s parents fled Durango during the Mexican revolution, leaving behind their upper-middle-class life in Mapimi, where Leonides was mayor. Establishing a secure economic footing in the United States was difficult for the González family, which grew to include Henry and his five siblings. Leonides served as editor of San Antonio’s La prensa newspaper, and the family home became a salon for expatriate Mexican intellectuals and politicians. Encouraged by his parents, Henry immersed himself in literary classics and in key Western political tracts. Henry attended the local public schools, learning English and working part-time during elementary school to help support his family. He graduated from Jefferson High School in 1935 and attended San Antonio College, where he earned an associate’s degree in 1937. For two years he attended the University of Texas in Austin, studying engineering and law, but he put his educational plans on hold during the Great Depression because he could not find enough work to pay his tuition.3 In 1943 González graduated with a bachelor of laws degree (LL.B.) from the St. Mary’s University School of Law in San Antonio, which granted him an honorary J.D. degree in 1965.4 During World War II, he served as a navy and an army intelligence censor for radio broadcasts and cable traffic. From 1943 to 1946, González was assistant chief probation officer for Bexar County’s juvenile court. He resigned from his post as chief probation officer when a local judge forbade him to hire an African American for his staff. Later Gonzaléz worked for the San Antonio Housing Authority, eventually managing a housing project on the western edge of the city.5 He married the former Bertha Cuellar in 1940 and they raised eight children: Henry B., Jr.; Rose Mary; Charles; Bertha; Stephen; Genevieve; Francis; and Anna Marie. In 1956 González shocked the Lone Star State by winning election to the Texas senate. The San Antonio News called González’s win a “staggering upset against long odds” considering President Dwight Eisenhower’s comfortable victory in González’s district. González ran an energetic campaign as “a man—not a name” and avoided ethnic appeals, helping him to win the confidence of his overwhelmingly Anglo constituency. González became the first Mexican American elected to the Texas senate and the first Mexican-American senator in more than a century.9 His victory was a potent symbol of the opportunities in state and national politics that would become available to Hispanic Americans over the next decade. When he arrived in the House, González sought his predecessor’s seat on the influential Armed Services Committee to allow him to meet the needs of the numerous military installations and military personnel in his district. González asked Vice President Johnson to help him attain the seat on Armed Services, but Speaker John McCormack of Massachusetts withheld it to avoid provoking more-senior Members seeking the assignment. González was appointed to the Committee on Banking and Currency, which remained his principal committee assignment although its name changed several times during his long career. 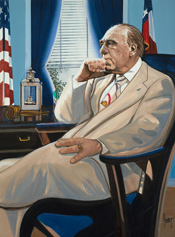 González became chairman of the Banking and Currency Committee in 1989 at the start of the 101st Congress. His gruff style sometimes rankled Democrats as well as Republicans.29 However, as one political almanac wrote, the “open and gentlemanly way” González led the panel contrasted with the turbulent tenure of the previous chairman, Fernand J. St. Germain, endearing the Texas Representative to many committee members.30 Under González’s leadership, the Banking Committee handled a raft of legislative initiatives, including flood insurance reform, affordable-housing initiatives, credit for small businesses, and stronger laws to prevent financial crimes like money laundering and bank fraud. Later that fall, Chairman González successfully shepherded through Congress a provision that created the National Housing Trust, lowering mortgage rates for first-time homebuyers and providing funding for down payments. As signed into law, the measure authorized nearly $57 billion in federal spending for a variety of programs, including rent subsidies, public housing, and financial aid for the elderly and disabled, with the aim of increasing the housing stock by more than 350,000 units. For the first time, the federal government issued block grants to meet the housing needs of state and local agencies; this provision was backed by Republicans who were hoping to limit direct spending on housing projects. Again, the committee consideration process was open and often chaotic, and when House and Senate conferees met to reconcile their versions of the measures, González resisted efforts to end public housing construction, eventually getting Home Ownership Made Easy (HOME) grants, portions of which had to be spent directly on the construction of affordable housing. “I have seen what public housing can do,” González said, recalling his years in San Antonio. “I would hope we’d not [kill] this—not just out of respect for me—but out of responsiveness to the poor.”35 The conference report passed the House on October 25 by voice vote, and the measure was signed into law by President Bush on November 28, 1991. 1Henry González, “From Participation to Equality,” in Philip L. Fetzer, ed., The Ethnic Moment: The Search for Equality in the American Experience (Armonk, NY: M. E. Sharpe, 1996): 172. 2Gonzalez, Henry B.,” Current Biography Year Book, 1993 (New York: H. W. Wilson and Company, 1993): 214. 3“González, Henry B.,” American National Biography Online. 4“Henry Barbosa González,” in Notable Latino Americans: A Biographical Dictionary, Matt S. Meier, ed. (Westport, CT: Greenwood Press, 1997): 183–184. 5Eugene Rodriguez, Jr., Henry B. Gonzalez: A Political Profile (New York: Arno Press, 1976): 57–58. 6González, “From Participation to Equality”: 156, 158. 7Rodriguez, Henry B. Gonzalez: 50–57; quotation on p. 55. 8González, “From Participation to Equality”: 162; see also Juan Gómez-Quiñones, Chicano Politics: Reality and Promise, 1940–1990 (Albuquerque: University of New Mexico Press, 1990): 58; Rodriguez, Henry B. Gonzalez: 60–72. 9Antonio Navvaro, a native Texan of Spanish descent, was appointed a state senator in 1846. See Rodriguez, Henry B. Gonzalez: 77. 10“Integrationists in Texas Lose Fight; to Try Again,” 4 May 1957, Washington Post: A10; “Bias Delays Pledged: Two Texas Senators Plan New Segregation Filibusters,” 4 May 1957, New York Times: 43. 11“Texas: For Whom the Bells Toll,” 13 May 1957, Time: 27. 12“Texas Race Poses Integration Test,” 11 May 1958, New York Times: 52; Rodriguez, Henry B. Gonzalez: 86–87. 13Michelle Garcia, “Henry B. Gonzalez’s Last Stand,” 8 November 1998, Fort Worth Star-Telegram: E1. 14Dave Harmon, “His Crusades Over, Henry B. Returns Home; San Antonio Democrat Leaves,” 3 January 1999, Austin American-Statesman: A1. 15“Texas G.O.P. Predicts Victory in Special Race for House Seat,” 3 June 1961, New York Times: 8; “All-Out House Race Nearing Close in Texas,” 29 October 1961, Chicago Tribune: 9; “The Ex-President,” 4 November 1961, Christian Science Monitor: 9; “A Bias-Free Vote Asked by Johnson,” 4 November 1961, New York Times: 10; “Gonzalez, Democrat, Is Winner in Texas Race for House Seat,” 5 November 1961, New York Times: 1; “Victory Conceded by Goode: ‘New Frontiersman’ Gonzalez Wins Congress Seat in Texas Election,” 5 November 1961, Washington Post: A1. 16For election results, see Michael J. Dubin et al., United States Congressional Elections, 1788–1997 (Jefferson, NC: McFarland & Company, Inc., 1998): 629. The New York Times claimed that the turnout set a record for Texas special elections; see “Democrats Cheer Victory in Texas,” 6 November 1961, New York Times: 42. 17“Texas Winner Claims an O.K. for Kennedy,” 6 November 1961, Chicago Tribune: 3. 18“Election Statistics, 1920 to Present,” http://history.house.gov/institution/election-statistics/election-statistics/; and various editions of the Congressional Directory and the Almanac of American Politics (1972 to present). 19“Election Statistics, 1920 to Present,” http://history.house.gov/institution/election-statistics/election-statistics/. 20González, “From Participation to Equality”: 165. 21Julie Leininger Pycior, “Henry B. Gonzalez,” in Profiles in Power: Twentieth-Century Texans in Washington (Austin: University of Texas Press, 2004, Rev. ed. ): 302. 22For a useful overview of the Bracero Program, see Gilbert Paul Carrasco, “Bracero Program,” in The Oxford Encyclopedia of Latinos and Latinas in the United States, Suzanne Oboler and Deena J. González, eds., vol. 1 (New York: Oxford: 2005): 220–224. The following regional studies of the Bracero Program are also useful: Erasmo Gamboa, Mexican Labor and World War II: Braceros in the Pacific Northwest, 1942–1947 (Austin: University of Texas Press, 1990); Ernesto Galarza, Farm Workers and Agri-Business in California, 1947–1960 (Notre Dame, IN: University of Notre Dame Press, 1977). 23Politics in America, 1990 (Washington, D.C.: Congressional Quarterly, Inc., 1989): 1488. 24For the quotation, see Thomas J. Foley, “‘Brown Power’ Parley Opens This Weekend,’” 22 October 1971, Los Angeles Times: A18. See also Jack Rosenthal, “U.S. Latins Vote Political Drive: Office in Capital Planned by Spanish-Speaking Unit,” 25 October 1971, New York Times: 17. 25Paul Houston, “Rep. Gonzalez: He Packs a Punch When It Gets Tense,” 15 July 1990, Los Angeles Times: A1. 26The date of González’s departure from the Congressional Hispanic Caucus is unclear, though it was likely between 1986 and 1987. 27The name of the Banking and Currency Committee eventually was changed to Banking, Finance, and Urban Affairs; the name of González’s subcommittee was changed to International Development, Institutions, and Finance in the 94th Congress. 28See, for instance, David R. Francis, “Nixon Acts to Stifle Congress: Tough Stand on Expropriation,” 22 January 1972, Christian Science Monitor: 8. 29Robert M. Garsson, “Will Gonzalez Punish His Challengers, or Cultivate Them?” 10 December 1990, The American Banker. González had a frosty relationship with House leaders, including Speaker Thomas Foley of Washington. Some complained privately that González ignored subcommittee chairmen and operated “in a vacuum.” Just before the start of the 102nd Congress, González’s opponents sought to remove him from the chairmanship of the Banking and Currency Committee, but González survived a vote in the Democratic Caucus, 163 to 89. 30Politics in America, 1990 (Washington, D.C.: Congressional Quarterly, Inc., 1989): 1485. 31Congressional Record, House, 98th Cong., 1st sess. (25 April 1983): 9610. 32Almanac of American Politics, 1992 (Washington, D.C.: National Journal Inc., 1991): 1225. For González’s independence on the bill to bail out savings and loan associations, see Paul Duke, Jr., “House Banking Panel Chief Gonzalez, Despite Doubts of Critics, Helps Keep Thrift Bill Tough,” 19 July 1989, Wall Street Journal: A16. This was a point of pride for González who, as early as 1954, was known to have rejected a gift of $14,000 in bank stock from a San Antonio lobbyist. See Vincent J. Burke, “Offered $14,000 Bank Stock, Lawmaker Says,” 4 August 1964, Los Angeles Times: 4; Congressional Record, House, 101st Cong., 1st sess. (4 April 1989): 5365. 33“Sweeping Thrift Bailout Bill Cleared,” Congressional Quarterly Almanac, 101st Cong., 1st sess., 1989, vol. XLV (Washington, D.C.: Congressional Quarterly, Inc., 1989): 117–133. 34For a comprehensive summary of the measure and House action on the measure, see “U.S. Housing Programs Overhauled: Bill Aimed to Increase Stock of Affordable Homes,” Congressional Quarterly Almanac, 1990 (Washington, D.C.: Congressional Quarterly, Inc., 1990): 631–647. 35“U.S. Housing Programs Overhauled”: 643. 36Congressional Quarterly Almanac, 1991 (Washington, D.C.: Congressional Quarterly, Inc., 1991): 76–78. 37Congressional Record, House 98th Cong., 2nd sess. (4 June 1984): 14821. 38González, “From Participation to Equality”: 168. 39For more on González’s efforts to introduce transparency at the Federal Reserve Bank, which routinely led to conflict with powerful Fed Chairman Alan Greenspan, see Robert D. Auerbach, Deception and Abuse at the Fed: Henry B. Gonzalez Battles Alan Greenspan’s Bank (Austin: University of Texas Press, 2008). 40Henry B. Gonzalez, “The Relinquishment of Co-Equality by Congress,” Harvard Journal on Legislation 29 (Summer 1992): 331–356; quotations on pp. 331, 355–356. 42Michael Canfield and Alan J. Weberman, Coup d’Etat in America: The CIA and the Assassination of John F. Kennedy (New York: The Third Press/Joseph Okpaku Publishing Company, Inc., 1975): xvii–xviii. 43Among his complaints, González cited the committee and staff as “an administrative nightmare” and characterized Sprague, a former Philadelphia prosecutor, as “insubordinate, and insulting, not to mention disloyal.” David Burnham, “Gonzalez, Assailing His Committee, Quits as Assassination Inquiry Head,” 3 March 1977, New York Times: 1; George Lardner, Jr., “Gonzalez Submits Resignation from JFK-King Panel,” 3 March 1977, Washington Post: A1; T. R. Reid, “Rep. Gonzalez, Sprague Told to Work Together,” 26 February 1977, Washington Post: A2; George Lardner, Jr., “Rep. Gonzalez Trying to Fire Sprague,” 11 February 1977, Washington Post: A1; David Burnham, “Sprague Ouster Is Upset by Panel on Assassination,” 11 February 1977, Washington Post: A1. González also claimed that interference by organized crime had undermined the investigation. Some speculated that the House would dissolve the panel with González’s departure, but its leadership was transferred to Representative Louis Stokes of Ohio. Eventually, the panel, whose activities were covered widely in the media, filed a report that Kennedy was likely killed as part of a conspiracy. For more on the committee and its work, see Sylvia Meagher, Master Index to the JFK Assassination Investigations: The Reports and Supporting Volumes of the House Select Committee on Assassinations and the Warren Commission (Metuchen, NJ: Scarecrow Press, 1980). González’s dispute with Sprague damaged his reputation among his House colleagues. For an analysis of González’s ostracism by the establishment, see Christopher Hitchens, “No Fool on the Hill,” Harper’s Magazine 285 (October 1992): 84–96. 45Some of González’s actions did not endear him to his colleagues. After steering the savings and loan bailout to a successful conclusion in the summer of 1989, González pursued an investigation of Charles Keating and the Keating Five, a group of Senators (four of them Democrats) who came under intense scrutiny for their connections to the head of the failed Lincoln Savings and Loan Bank, which cost U.S. taxpayers roughly $3 billion. 46Robert Cwiklik, House Rules: A Freshman Congressman’s Initiation to the Backslapping, Backpedaling, and Backstabbing Ways of Washington (New York: Villiard Books, 1991): 121–122. 47Harmon, “His Crusades Over, Henry B. Returns Home; San Antonio Democrat Leaves.” Some of González’s critics were far less charitable. Late in González’s career, Politics in America observed that he was “all but dismissed in the House as a flake”; see Politics in America, 1990: 1485. “His dedication to principle has sometimes reduced his effectiveness,” observed a biographer; see Meier, “Henry Barbosa González,” 183; Bicknell Eubanks, “Gonzalez: A Sturdy Liberal,” 10 November 1961, Christian Science Monitor: 16. 48Christopher Marquis, “Henry Gonzalez, 84; Served 37 Years in House,” 20 November 2000, New York Times: A33. González also had a reputation for being gruff and pugnacious. In October 1963, González was one of fewer than two dozen House lawmakers who voted to abolish the House Un-American Activities Committee. Republican Representative Ed Foreman of Texas was quoted in several papers as having called the San Antonio Congressman a communist in response to González’s vote. González confronted Foreman on the House Floor, and a physical altercation ensued. See “Capitol Hill Rematch Is Off,” 30 October 1963, Washington Evening Star; and Jerry Doolittle, “‘One-Punch’ Gonzalez Doesn’t Faze Foreman,” 30 October 1963, Washington Post: A1. In 1986, González allegedly assaulted a constituent at a San Antonio diner after he overheard the man call him a communist. The district attorney, whom González later called a coward, charged González with misdemeanor assault, but the charges were eventually dropped. Pycior, “Henry B. Gonzalez”: 303; Rodriguez, Henry B. Gonzalez: 125–127; Renee Haines, “Congressman Charged with Assaulting Constituent,” 5 May 1987, United Press International. 50“Longtime Rep. Henry B. Gonzalez Plans Retirement,” 4 September 1997, Associated Press; Catalina Camia, “Gonzalez Departure Will Be End of Era; Texas Iconoclast Championed Host of Causes for Democrats,” 5 September 1997, Dallas Morning News: 1A. 51Edward Roybal and Lucille Roybal-Allard became the first father-daughter pair of U.S. Representatives when Roybal-Allard succeeded her father in his Los Angeles-area district at the start of the 103rd Congress (1993–1995). Félix Córdova Dávila (1917–1932) and Jorge Luis Córdova-Díaz (1968–1973), a father-son team of Puerto Rican Resident Commissioners, were the first Hispanic parent-child combination in Congress. 52Congressional Record, House, 105th Cong., 1st sess. (7 October 1997): 21519. For the rest of the tributes, see pp. 21517–21525. 53For an obituary, see Christopher Marquis, “Henry Gonzalez, 84; Served 37 Years in House,” 29 November 2000, New York Times: A33. Papers: ca. 1946-1998, approximately 500 cubic feet. The Henry B. González Papers include over 500 cubic feet of correspondence, committee records, campaign files, schedules, personal schedules, appointments, legislative files, photographs, video and audiotapes, memorabilia and artifacts. The papers document Congressman González's years of public service as an elected official on the San Antonio City Council, the Texas State Senate, and the U.S. Congress, though the bulk of the records document his tenure as U.S. Representative from Texas (1961-1998). A finding aid is available in the repository and online. Auerbach, Robert D. Deception and Abuse at the Fed; Henry B. Gonzalez Battles Alan Greenspan's Bank. Austin, TX: University of Texas Press, 2008. Flynn, Jean. Henry B. Gonzalez: Rebel With a Cause. Austin, TX. : Eakin Press, 2004. Gonzalez, Henry B. "The Relinquishment of Co-Equality by Congress." Harvard Journal on Legislation29 (Summer 1992): 331-56. Haugen, Brenda. Henry B. Gonzalez: Congressman of the People. Minneapolis, MN: Compass Point Books, 2006. "Henry B. González" in Hispanic Americans in Congress, 1822-2012. Prepared under the direction of the Committee on House Administration by the Office of the Historian and the Office of the Clerk, U.S. House of Representatives. Washington, D. C.: Government Printing Office, 2012. Pycior, Julie Leininger. "Henry B. Gonzalez," in Kenneth E. Hendrickson, Michael L. Collins, and Patrick Cox, eds. Profiles in Power: Twentieth-Century Texans in Washington. Austin, TX. : University of Texas Press, 1993. Ralph Nader Congress Project. Citizens Look at Congress: Henry B. Gonzalez, Democratic Representative from Texas. Washington, D. C: Grossman Publishers, 1972. Rodriguez, Eugene. Henry B. Gonzalez: A Political Profile. New York: Arno Press, 1976. Sloane, Todd A. Gonzalez of Texas: A Congressman for the People.Evanston, IL: John Gordon Burke Publishing, 1996. Wheelock, Warren. Hispanic Heros of the U.S.A.: Book Two.St. Paul, MN: EMC Corp, 1976. Wheelock, Warren and J. O. "Rocky" Maynes, Jr. Henry B. González, Greater Justice for All; Trini Lopez, the Latin Sound; Edward Roybal, Awaken the Sleeping Giant. Consultants, Jorge Valdivieso, Amalia Pérez, Fabiola Franco. St. Paul, MN: EMC Corp., 1976.